The number of official political groups in the European Parliament has risen to eight since the creation of Identity, Tradition, Sovereignty (ITS) by far-right parties and an independent MEP. France's anti-immigration National Front (FN) is the biggest party in the ITS and one of its seven members. Bruno Gollnisch is the group's chairman as well as deputy leader of the FN. 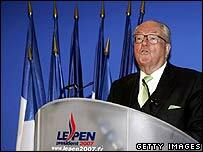 The FN's leader, French presidential hopeful Jean-Marie Le Pen, is also a member along with his daughter Marine. Mr Le Pen has been convicted in the past of racism or anti-Semitism. 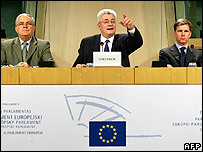 He led two previous groups at the European Parliament - the Group of the European Right from 1984 to 1989, and the Technical Group of the European Right from 1989 to 1994. Mr Gollnisch is awaiting a verdict in a trial over remarks he made questioning the use of gas chambers in the Nazi death camps. The other FN MEPs are Carl Lang, Fernand Le Rachinel, Jean-Claude Martinez and Lydia Schenardi. The five MEPs from the ultra-nationalist Greater Romania Party (Parti Romania Mare) were crucial in making up the caucus for forming the ITS. Party leader Corneliu Vadim Tudor, who is not among the five MEPs, has been accused of xenophobia and anti-Semitism. The five MEPs are Daniela Buruiana Aprodu, Eugen Mihaescu, Viorica Pompilia Georgeta Moisuc, Petre Popeanga and Cristian Stanescu. Belgium's Flemish Interest (Vlaams Belang) has three members in the ITS: Franck Vanhecke, Koenraad Dillen and Philip Claeys. The party campaigns on a platform of independence for Flanders, the richer, Dutch-speaking part of the country and on an anti-immigration integrationist stance towards minorities. It was formed in 2004 after its earlier incarnation, the Flemish Block (Vlaams Blok), was declared a racist organisation by Belgium's highest court and the party was effectively shut down. Alessandra Mussolini, grand-daughter of the former dictator Benito, is one of Italy's two MEPs in the ITS. She was elected as a candidate for Social Alternative (Alternativa Sociale), a coalition of far-right political parties in Italy. The other Italian member of ITS is Luca Romagnoli, from fellow far-right party Tricolour Flame (Fiamma Tricolore). Andreas Moelzer is a member of Austria's far-right Freedom Party. 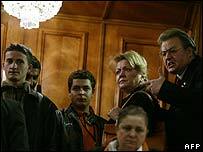 He was expelled from the party over disagreements with its leader, Joerg Haider, but returned after Mr Haider left in 2005 to form a new party amid reports that the Freedom Party had become too extremist. Dimitar Stoyanov, who is only 23 years old, is a member of Bulgaria's Attack Coalition. The party's leader, Volen Siderov, came second in the run-off round of the 2006 presidential election with 24% of the vote. 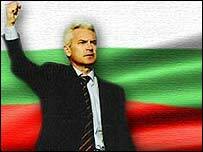 The party advocates a "mono-ethnic" Bulgaria. It has been accused of racism and xenophobia in a country which has Turkish and Roma minorities. Ashley Mote, an independent MEP for the South East of England, was a member of the UK Independence Party before his expulsion in 2004. He describes ITS as a "genuine centre-right multinational group" which opposes "a unitary, bureaucratic, European super-state" and promotes accountability and transparency. However, he has sought to distance himself from the domestic political activities of other members of the new group.